Two different boot designs but one key message; welcome in ‘Ousadia’ and ‘Alegria’, or Neymar’s new custom Hypervenom Phantom II. It has taken time to come to fruition, but the dynamic 24-year old Brazilian now has his own signature line-up that embodies the joy and self expression of living and playing soccer. Bruno Carneiro Mosciaro, a renowned Brasilian artist and designer best known as Bruno Big, is responsible for the boot’s vibrant graphics. I created two different images, one for ‘Ousadia’ and one for ‘Alegria.’ There is a heart and there is a hand, so the idea is intended to be more graphic than a direct message. That is the interesting point of it. While the graphic is intentionally abstract, the placement is purposeful. On the “Ousadia” boot (which is the left), fingers wrap around as if holding it. On the “Alegria” boot (which is the right), the fist is centered where it will make contact with the ball. 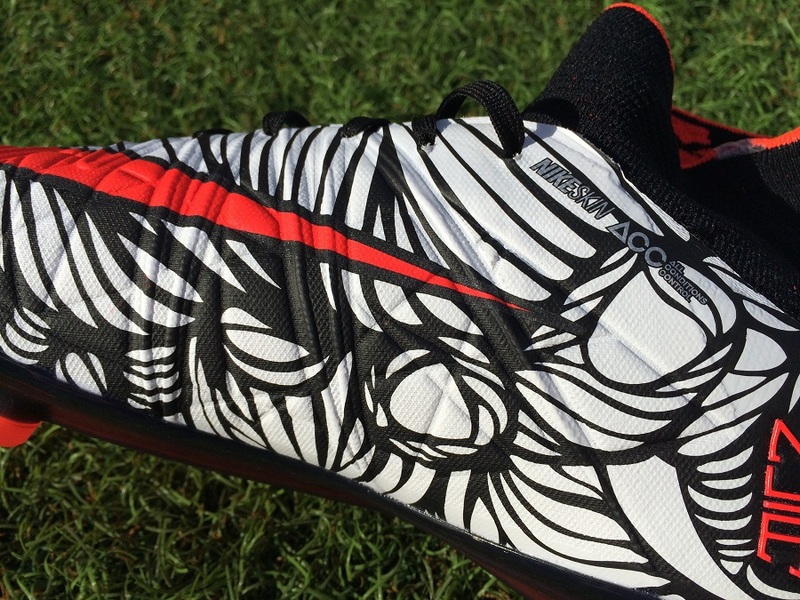 Providing a dual design is a very unique feature on any boot and sets these apart from any Hypervenom release to date. 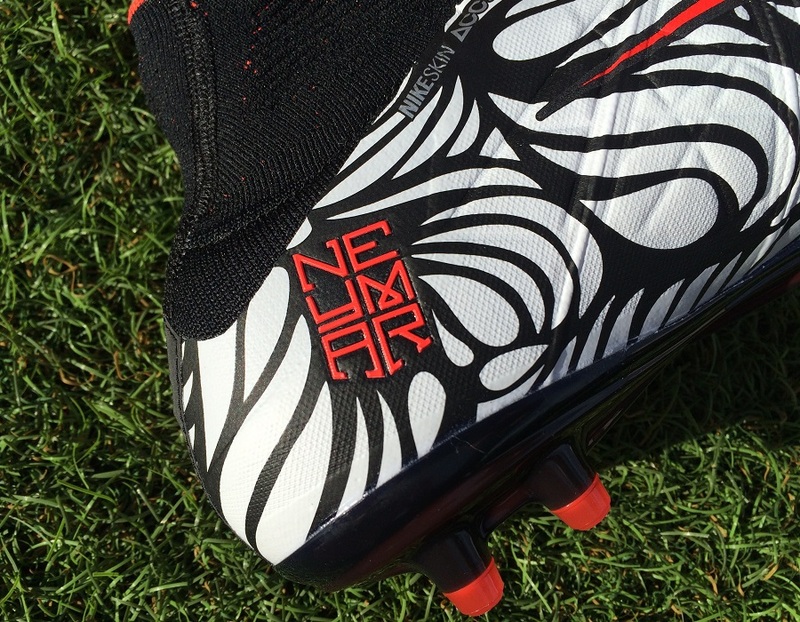 One aspect of the boot that really stands out is the NEYMAR text sitting along the heel. The blood red text pops off the black heel background in spectacular fashion. Plus the fact it has definition makes it even more dynamic. While wearing them, there is no way fellow players will be able to mistake these to anyone else. 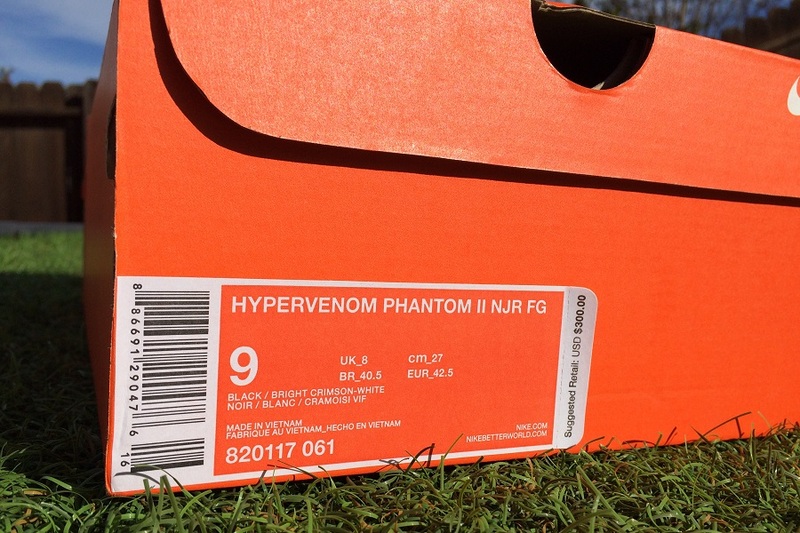 Along with the tagline “Deceptive by Nature“, Nike introduced the second generation Hypervenom last June. This version features a much more specific purpose, with a plethora of dynamic pieces to improve performance for attack minded players. 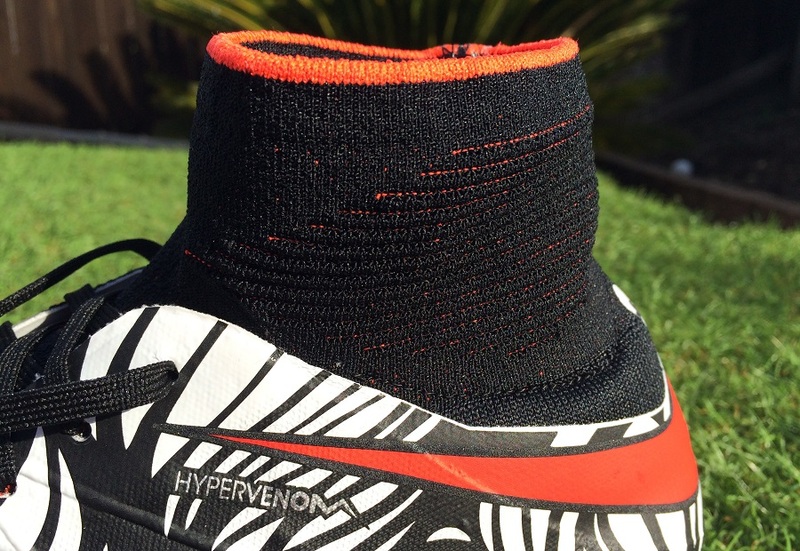 For example, Nike decided to provide a sense of enhanced fit and support around the ankle line of the Hypervenom II with the inclusion of a mid-cut collar. 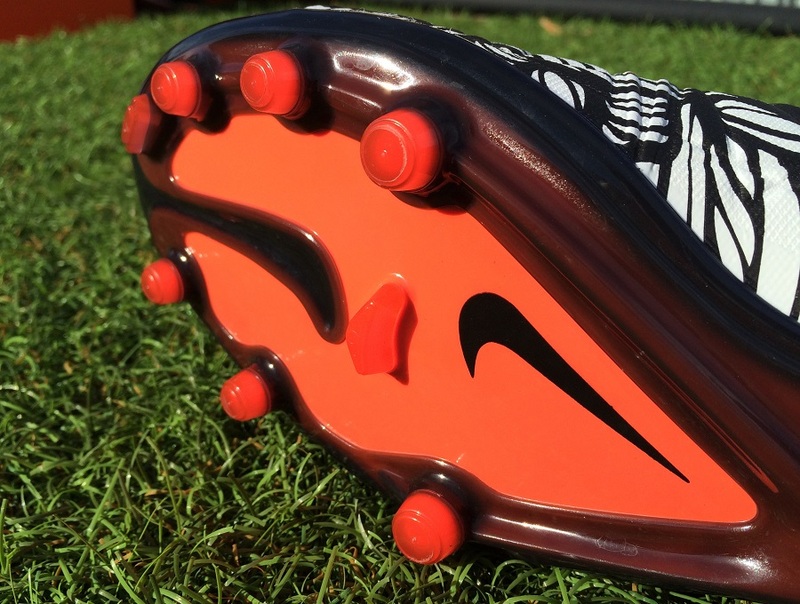 Nike Flywire was then added through the upper in an effort to secure the foot down against the soleplate. The concept is simple; provide a locked down feel while ensuring your foot moves symbiotically with the boot. Everything about these boots is geared toward attack natured players, those that like to make quick turns and use reactionary movement as part of their game. 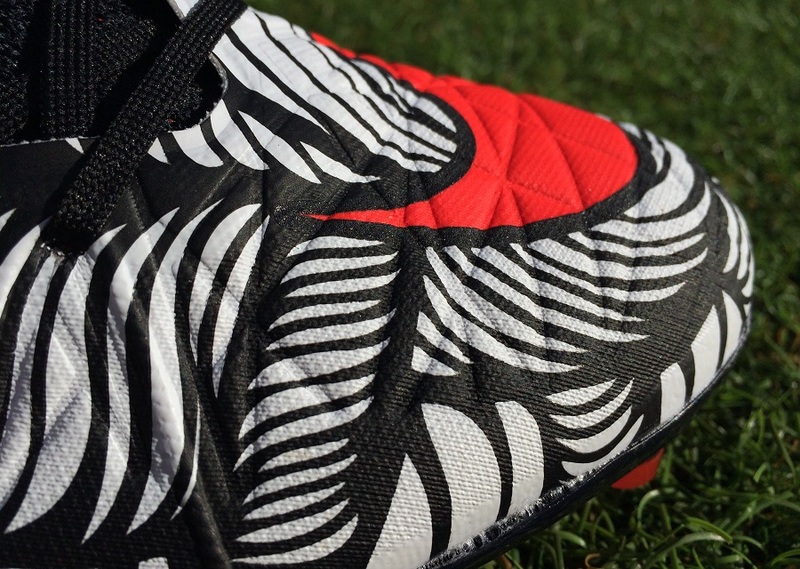 As a result, the soleplate of Hypervenom II is comprised of a softer compound than the original for added comfort. 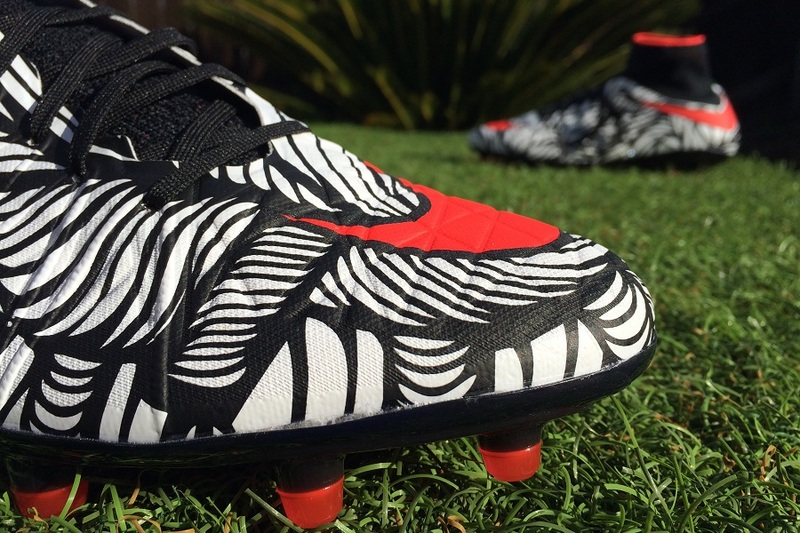 The split-toe design and agility traction pattern unleash a quick response for sudden changes of direction. Each of the conical studs (6 toward the front and 4 on the heel) feature a low profile and are pretty narrow in nature. Thus, they are perfect with quick entry and release from the surface players look to push away. From a personal perspective, this is not a release I’d be clamoring to pick-up. As awesome as it is to see Neymar rewarded with his own line, there a few reasons I’m not a fan of this particular release. 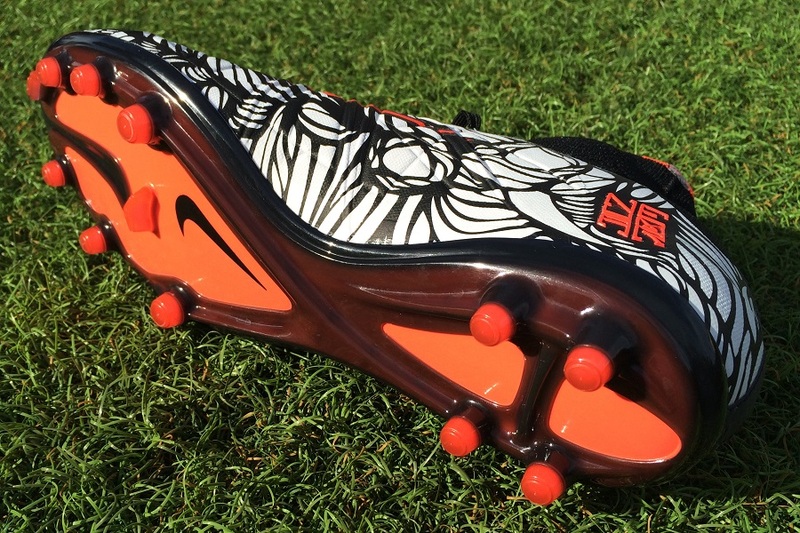 First, the design itself just doesn’t transcend well onto the boots. I get the premise and have respect for the meaning instilled by the artist, Bruno Big. In fact, I love the design when it is placed straight up in a wall. But across the upper of a contoured boot, it looks rather confusing and slightly bland. 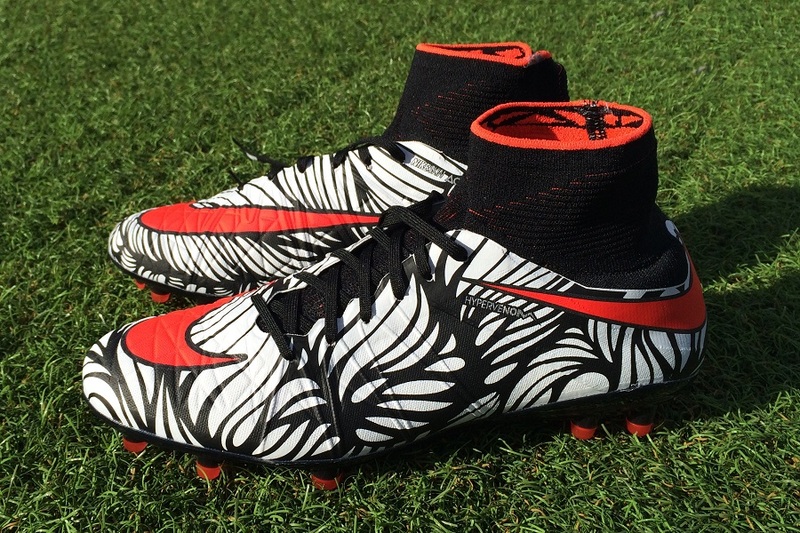 The second thing that puts me off is the fact Neymar is not actually wearing a pair of Hypervenom. His pair have been customized to his specifications. And with his appearance in Mercurial Superfly in recent times, it is difficult to know just how different his boots actually are. This is just my honest take, I’m sure a lot of other players will have different feelings about the visuals and general performance. If you want a pair, find them available from soccer.com. We’ve been told they picked up the largest allocation of the special edition boots, so it presents yours best bet for finding pairs in your size. 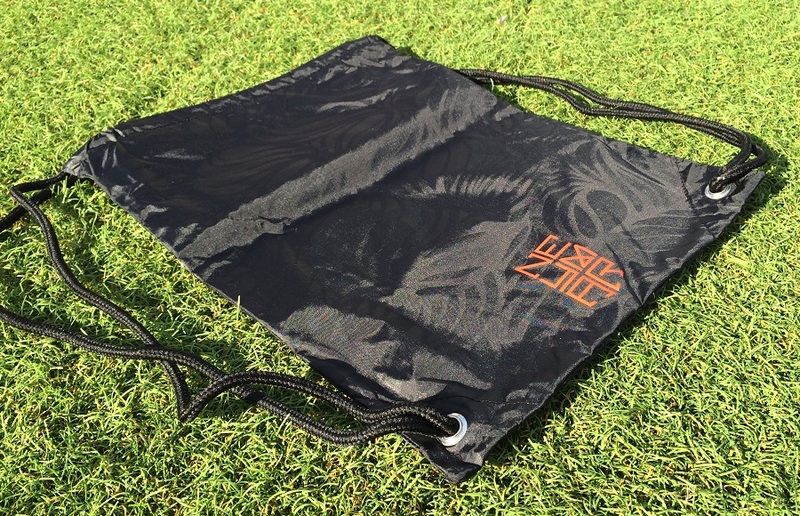 Included in the box is a pretty awesome boot bag, one of the finer additions I’ve seen with any pair of Nike boots in recent times. The Ousadia Alegria pattern is gently grafted onto the front and back, creating a slick visual!